With its spectacular seaside and scenery, the Italian Riviera makes for one of the best destinations in Italy. It is a stretch of coastline in the northwestern corner of Italy, stretching from the Italian-French border to the Tuscan border: an enchanting mix of history, pristine beaches, panoramic views, vibrantly colored homes and mouthwatering regional cuisine. In fact, lovers of la dolce vita and artists, writers, celebrities and royalty have been flocking to this glamorous destination since the 1800s - and it’s easy to see why! There’s something for everyone: picturesque hiking, open air markets, parks and dozens of quaint waterfront towns along miles of clear blue water. The list goes on and on! So have a look at our suggestions for your next trip. The Italian Riviera can become extremely crowded during the summer months, when vehicle traffic along the winding roads between the tiny towns becomes congested. If you go in the summer, you might want to avoid weekends and national holidays. The presence of the sea and the protection of the mountains produces an enviable mild climate — both in the winter and summer. The best months to visit are April, May, late September and October. This way you can avoid the summer crowds and still enjoy the warmer weather (and go into the water, if you like). Try to avoid driving here in the summer months. As we said in another previous post, we recommends taking advantage of private boat services connecting the Italian Riviera’s coastal villages. It is pesto. This sauce known all over the world hails from here, precisely in Genoa, and you should buy at least one jar to bring home. Mainly used as a pasta sauce, the traditional recipe uses basil leaves designated with the DOP trademark, pine nuts, olive oil, garlic, salt, grana and pecorino cheeses. Ask for pesto made the artisanal way, where the ingredients are ground with a wooden pestle in a marble mortar, rather than the one produced industrially which uses a mixer. When using the mixer, the ingredients are thrown in together, and the olive oil is added at the end. When using the pestle and mortar, the correct procedure is to put in and grind the garlic and the pine nuts with salt first, then the basil leaves, then the grated cheeses and finally the olive oil. 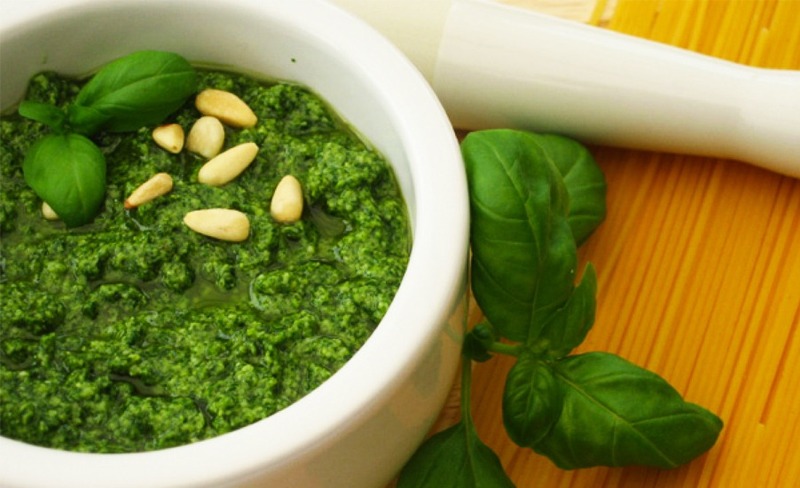 This is the way to obtain pesto’s correct flavor and texture. The region boasts other excellent gastronomy products. One of the best extra-virgin olive oil hails from here: we recommend buying it directly from the farmers in the inland areas. The region also produces excellent wines, including whites (e.g. Vermentino and Pigato), and reds (Rossese, Ormeasco and Ciliegiolo) and sweet wine (Sciacchetrà). Pair that sweet wine with desserts like spongata, buccellato and pandolce, which you can find at all local deli shops. Other Ligurian pastries, such as chifferi, cakes with pine nuts, baci and pane del marinaio can all be found in the local bakeries. 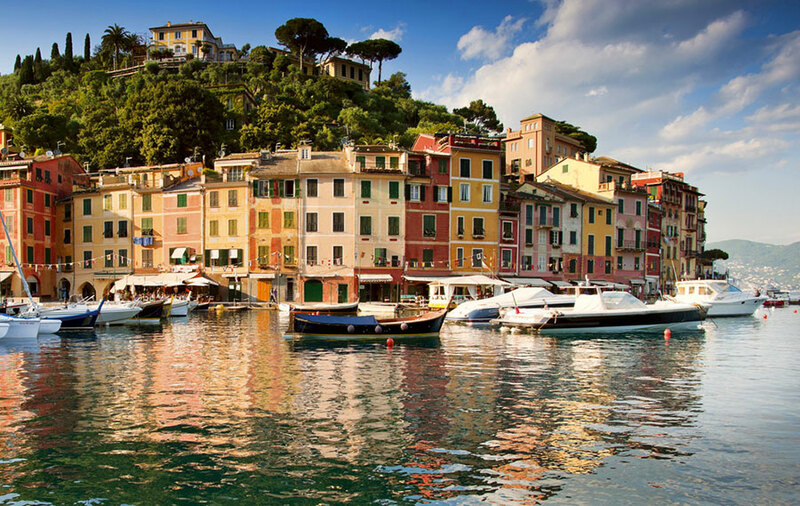 The best shopping in the Italian Riviera is found in Portofino. The luxe fishing village has stores from top Italian and international fashion designers, such as Ermenegildo Zegna, Salvatore Ferragamo, Missoni, Cartier, Louis Vuitton and Dior. Once you’ve refreshed your wardrobe, you can shop throughout the entire Italian Riviera for a wide range of products — from food and wine specialties to souvenirs, handicrafts and nautical objects. Non-food souvenirs include items with a marine theme, coral works, naval instruments and seashells. Enjoy the traditional Venetian appetizer ritual!